When the magnificent stone walls of Arundel Castle were first built, William the Conqueror had just taken over Britain after King Harold was shot in the eye. That should put into perspective just how historic this spectacular landmark is. 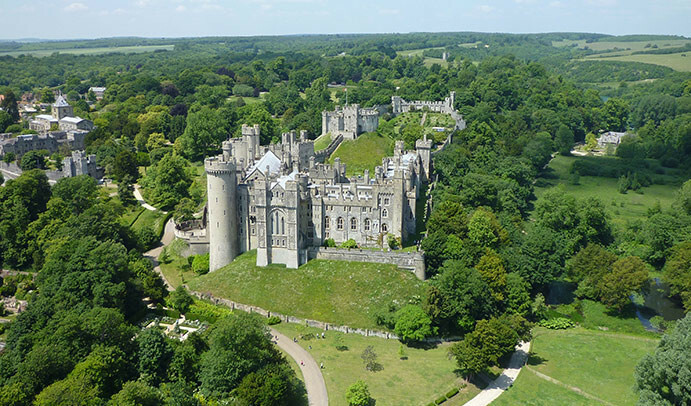 Arundel Castle in the charming West Sussex town of Arundel combines both medieval and restored sections to form a picture perfect image of a fairytale castle. It is actually one of England's largest complete and inhabited castles, set in the heart of 40 acres of stunning grounds and gardens. It also makes for an easy day trip for anyone in the South East from London to Brighton and further west towards Southampton and Salisbury. Founded in 1067 by Roger de Montgomery, the-then Earl of Arundel, the Castle now serves as the ancestral seat and family home of the 18th Duke of Norfolk. The Duke's opulent rooms and chapel in the Victorian part of the Castle can be viewed too, along with all the fascinating artefacts and photos of him with the Royal family. In fact, Queen Victoria herself once stayed within these walls. Approaching Arundel Castle through the stone gateway, I was impressed enough by the grandeur of the pristine stonework and medieval emblems, but then I made the gentle walk up the drive to the castle itself and was greeted by a phenomenal sight. It's the iconic picture postcard image of a castle inside and out. It's extremely well preserved and clean, and although much of it was built later by the Victorians, a large section features the original medieval features. That includes the 30-foot tall Norman Motte and a splendid Keep. 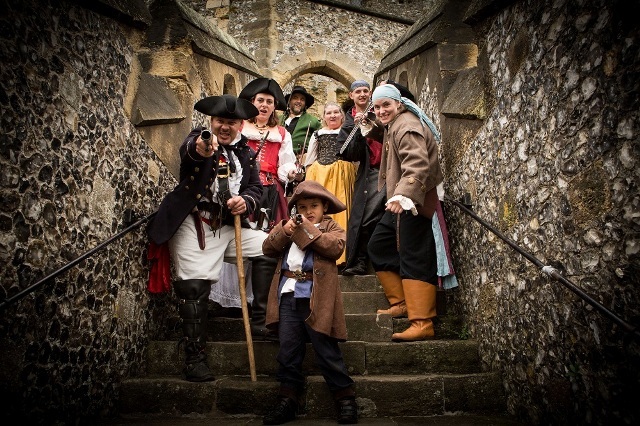 Part of the excitement comes in the Keep, at being able to wander around the tight winding stone staircases and across medieval towers to see breathtaking views across the South Downs and West Sussex. It's fun for all ages as you peer through narrow stone slits once used by soldiers to fire arrows from their crossbows. There's even an ancient toilet (where the word "sh*t hole" came from), a cellar prison, the room where the ladies maid lived and the hole where boiling hot bubbling oil was poured on approaching enemy soldiers. Further on in the younger part of the castle, visitors can see the bedrooms, living rooms and unmissable Regency Library of the Duke. There's also the Armoury and Barons' Hall where full suits of gleaming medieval armour and weapons fill the aisles. Continue on and you reach the the family's private chapel. Even for the non-religious, this is quite a room to behold, carved out in a French Gothic style, reminiscent of the features seen at Notre Dame in Paris, but on a much smaller scale. 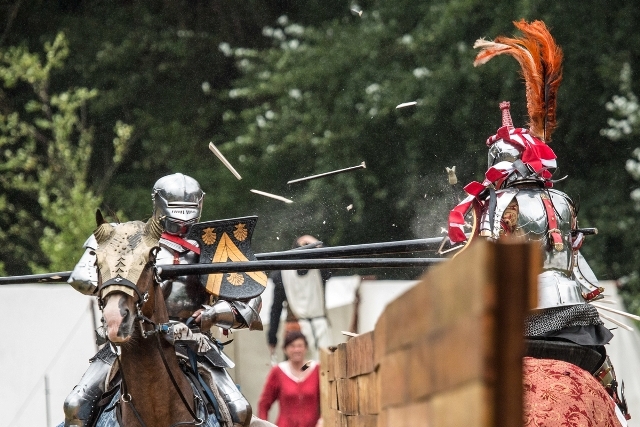 A renowned jousting festival takes place at Arundel Castle every year. 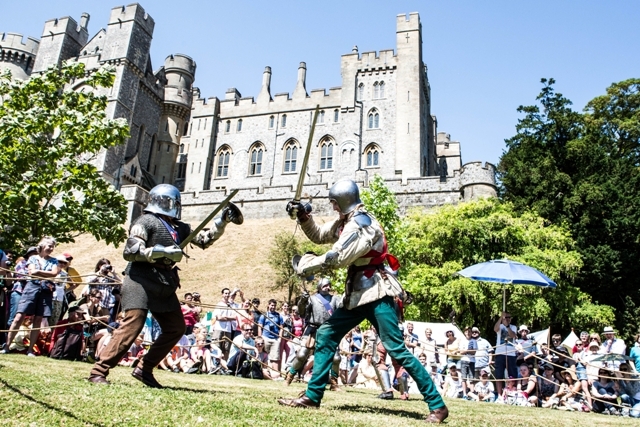 Arundel Castle boasts a very active calendar of special events and the highlight of these is the annual Jousting and Medieval Tournament Week in July. This showcases the skill, sportsmanship and flair of international competitors who appear like knights in shining armour to battle it out on horse or foot. Other events through the year (when the Castle is open between March and early November) include medieval days, when actors take on roles of characters around the castle walls, open-air Shakespeare play performances, classic car shows and re-enactments of high octane battles between Normans and Crusaders during a three-day castle siege. Beyond the castle walls, there's the vast, scenic grounds featuring walled gardens, glasshouses, a sweetly-scented Rose Garden and the highly acclaimed Stumpery. Make sure you allow time for these as you don't want to miss out on the best that nature has to offer. After my visit, I'm not surprised to find that TripAdvisor has awarded Arundel Castle a Certificate of Excellence for the past three years, which recognises that it is an attraction creating a high standard trip for visitors. For Arundel Castle brings to life Britain's medieval past. When you're standing on the high, historic castle keep walls, at the same spot where maidens, Normans and royalty have stood centuries before, it's impossible to not get swept away in all its splendor. Tickets start at £9 with options for a pre-booked guided tour.For more details visit www.arundelcastle.org. I remember visiting Arundel Castle on a school trip. It must have been the longest distance for a day out I can remember. We had to lots of coursework on it for our GCSEs. It was interesting.